Steven (Chicagoland, United States) on 14 September 2010 in Cityscape & Urban. The American flag captured on the Wrigley Building for the Fourth of July holiday. Photo captured on July 2, 2010. Superb photo. Light and colors are very beautiful. Excellent work Steven. Have a lovely day Steven. A fantastic shot Steven, it's so good it doesn't look real. Very professional. Well, normally I try to avoid it too, but in this particular case it's not disturbing at all... that's my sincere opinion. FYI : I'm on a mac, sometimes images are looking different when I see them on a pc. A superb vision Steven - the blue sky is outstanding and th buildings are very nicely framed. Great job as always sir! Cor blimey, strong blues here, but they do help to accentuate the sharpness of the buildings. I bet that Wrigley building was one of the city's tallest when it was built. 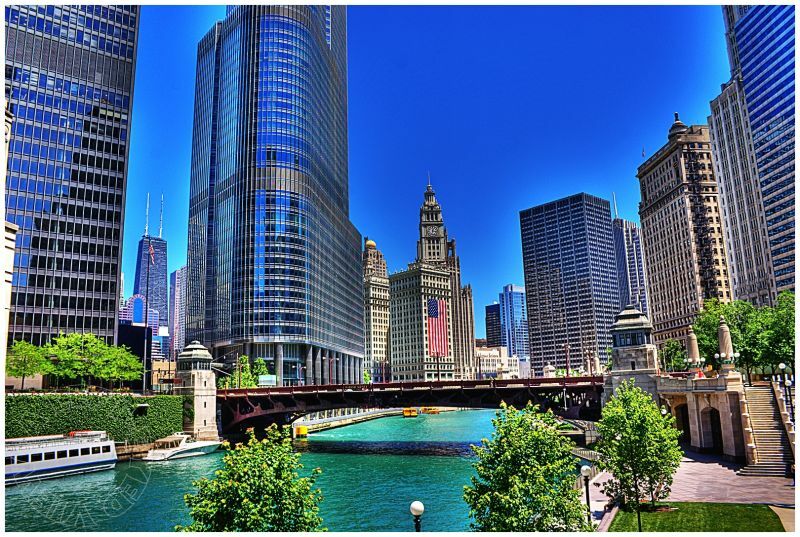 Another fabulous HDR of that great Windy City! an amazing image .. wonderful coloring well done ! Chicago looks like such a beautiful city. Lovely shot. What a grand view of the bridge and beyond. I enjoy the huge flag there. That glow on the buildings and their shininess looks very cool.